I’ve got two Razer keyboards to choose from. One is silent and sleek with chicklet-style membrane keys. The other’s mechanical switches click loud and proud. Which is best? I need a little help there. Update: The poll results are in! If you’d asked me five years ago whether I prefer a mechanical or membrane keyboard there would have been no question—I’d have taken clicky and precise over soft and silent any day. But over the past few years I’ve grown conflicted. Maybe it’s the endless days of typing away. Perhaps it has something to do with all the laptop time I’ve put in for reviews or during trips. I’ve gotten used to non-mechanical keyboards. Specifically I’ve gotten used to the chicklet-style membrane keyboards Razer introduced me to with the original Razer Blade. There’s enough of a click to them to satisfy my fingers, plus the short key travel times make me feel like I’m typing a mile a minute. But I do miss that click. The tangible feeling of switches being activated beneath my fingertips. When you do something with a mechanical keyboard, you’re doing the hell out of it. So here’s what I am working with. Right, so keyboards. 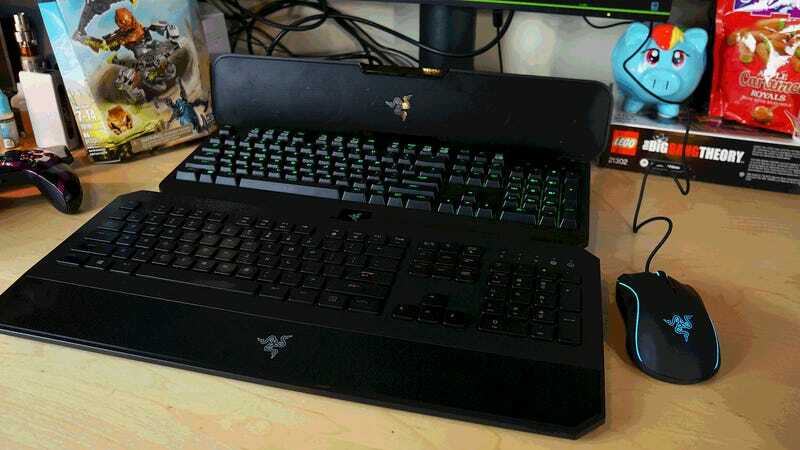 On the bottom we have the Razer DeathStalker Chroma, the colorized version of the company’s chicklet-key marvel. A few years back I reviewed the company’s $250 Star Wars: The Old Republic keyboard and said I’d love one without the weird Razer Blade digital trackpad dealie attached—this is pretty much that. They still make a version with the Switchblade interface called the DeathStalker Ultimate—it’s still $250 and I probably wouldn’t recommend it. The DeathStalker Chroma is a much more reasonable $99. The DeathStalker designation means it’s got those lovely rounded, fully-programmable chicklet keys with the low travel caps and 10-key rollover when set to gaming mode in Razer’s Synapse software. The Chroma designation means it’s got three separate colored lighting sections capable of generating some 16.8 million color combinations. For $20 less you can buy a DeathStalker that’s just green. I guess that’s okay too. Bright colors aside, this is a stealthy piece of typing technology. Not completely quiet, but it’s muffled enough that it won’t drive someone trying to do something requiring concentration in the same room completely insane. 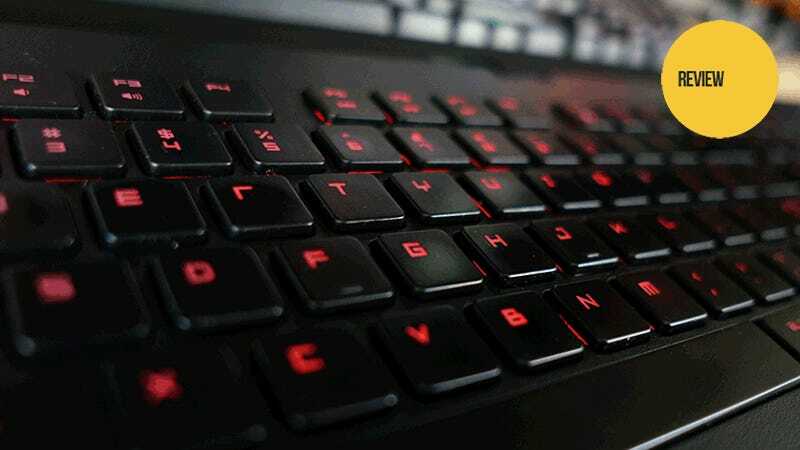 In the top corner, wearing Razer’s signature black and green, is the 2016 version of the company’s most popular mechanical keyboards, the BlackWidow Ultimate. This is Razer’s favorite snake of a gaming keyboard, and judging by the results of last week’s Kinja Co-Op poll the entire series is highly regarded by both our readers and the internet at large. The 2016 BlackWidow Ultimate showed up too late to the party to participate, but had it shown up a bit sooner it may have stolen its more expensive Chroma-colored cousin’s thunder. It’s the follow-up to the 2014 BlackWidow Ultimate, which marked the debut of Razer’s own mechanical switch technology (the clickety Razer Green and muffled Razer Orange). That version made Luke Plunkett a believer, and the series has been going strong since. The 2016 version has a few key differences over the 2014 one. The footprint is noticeably smaller, thanks to the removal of dedicated macro keys—who needs them when the entire keyboard is programmable? The status indicator is much more visible—I had trouble seeing when my caps lock was on with the older version. The space bar has an LED now—in fact every single key on the 2016 BlackWidow Ultimate has its own individual LED, meaning you can do some completely goofy stuff with lighting configurations (check out the video below for my personal favorite preset, Starlight). The two audio jacks have been combined into one, the top cover features a new smudge-free finish instead of the old soft touch—it’s just got a nicer feel to it overall. I’m a huge fan of the smaller footprint—one of my favorite keyboards of all-time is the BlackWidow Tournament Edition, which does away with the number keys on the right altogether. One other advantage the 2016 BlackWidow has over the older edition is price—the new keyboard is only $109.99 to the older one’s $129.99. The DeathStalker is colorful yet quiet. For a non-mechanical keyboard it’s got an excellent feel. The keys are all programmable, the response time is excellent. Other than the keys the main difference is a lovely wide wrist rest. The BlackWidow is the latest iterations of the most beloved clicky keyboard on the market. The keys are all programmable, response time excellent. It’s got a much more tactile feel to it—when you hit those keys you are hitting those keys—but I feel like my fingers flow across the deeper keys slightly slower. Now that I’ve stealthily reviewed two keyboards in one article, I have a choice to make, and I obviously can’t make it myself. There isn’t room on this desk for two different keyboards. I mean there is right now, but no way my desk is staying this uncluttered for longer than the time it takes to write this article. I leave the ultimate choice up to you via poll. I’ll let it run until tomorrow morning, and whichever keyboard you folks decide on will remain. Let’s see Razer rally the troops when both products being voted on belong to them. Update: Well there we have it, victory for the mechanical crowd. Between the poll numbers and the hammering I got on Twitter last nught after @Razer tweeted out the question, it’s clear where keyboard loyaties lie. Mechanical keyboard enthusiasts, like their passion, are a very loud bunch. Still it wasn’t the landslide victory it might have been a few years back. The membrane minority is a nice-sized group, and whisper-quiet to boot.